Part One, Part Two, Part Three, Part Four, Part Five, Part Six, and Part Seven. Making some progress this time! Strap in! King Aman the Wise was in pretty good shape when we left off. 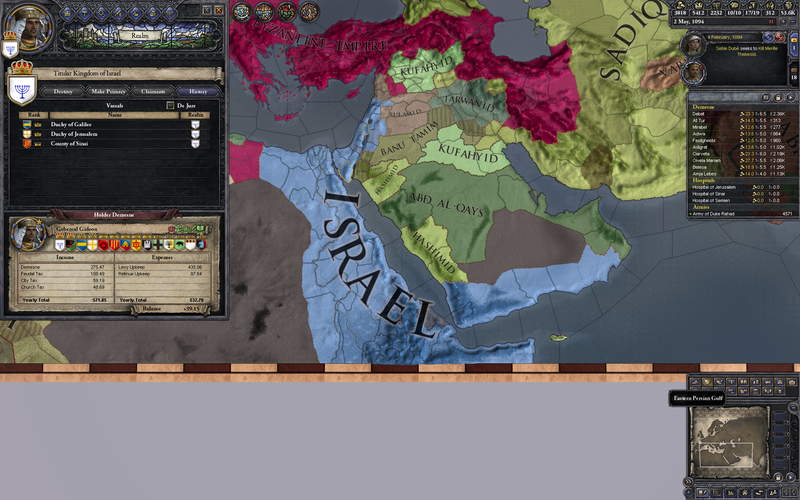 Three sons, working on some claims to the remaining bits of Israel, and a strong military. Also insane. I have a false claim to Negev so I go for that right away. 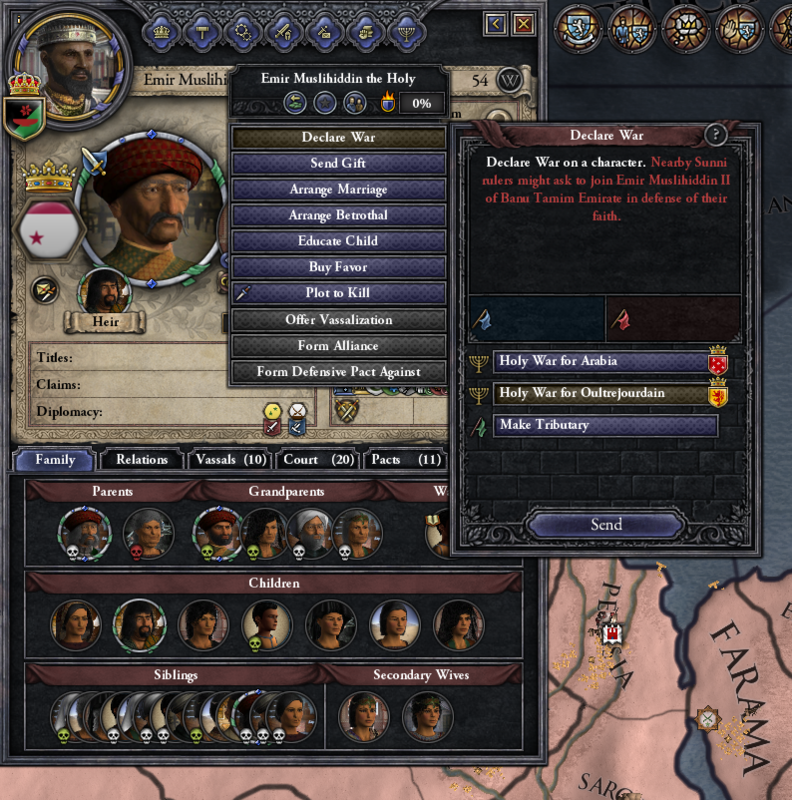 The ruler of Wadi Musa and I still have a truce from the last war, so I have to wait that out or assassinate him. 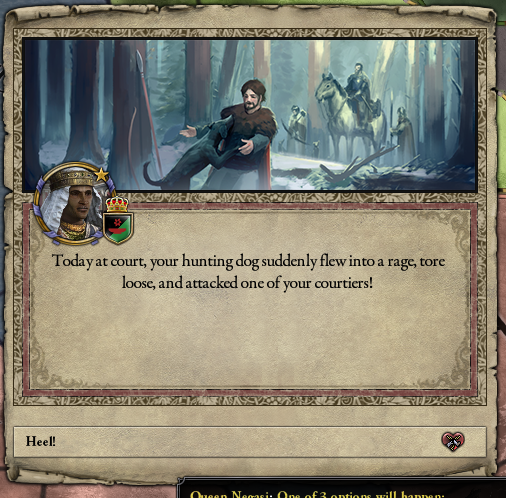 Also, my vassals are getting uppity again. I get lucky in Negev and capture the enemy leader in the first battle, so that wraps up nicely! 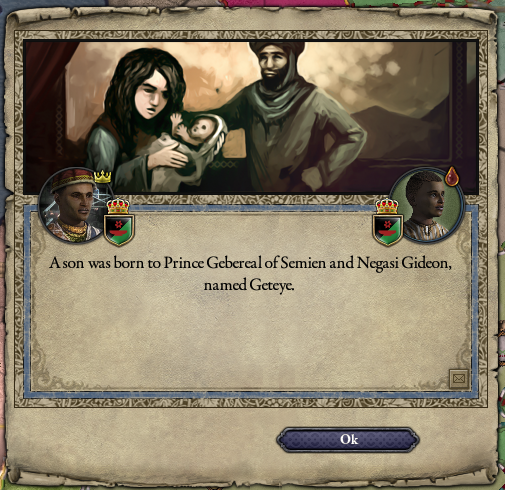 My heir, Prince Gebereal. He’s not quite the badass his father is, but he’s acceptable. He also has two sons already. And this one, Galilee. Irritatingly both contain territory controlled by several different countries, making a simple holy war to take them impractical. 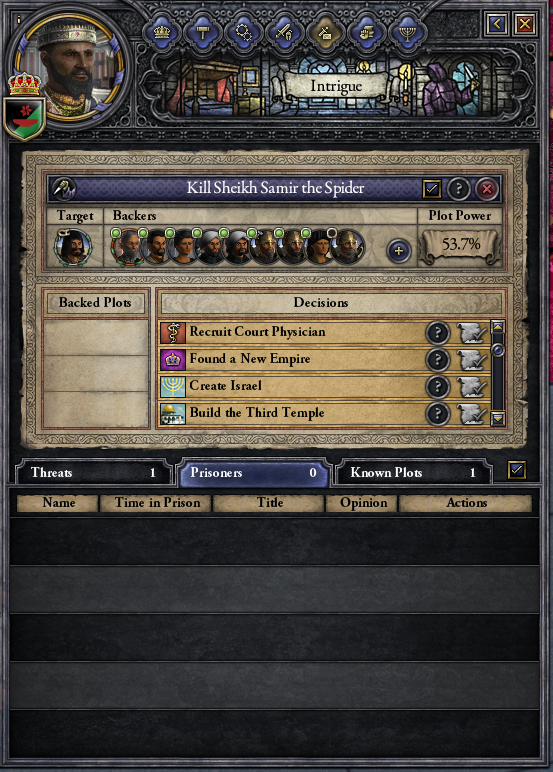 To avoid having to wait out the truce with Sheikh Samir, I try to kill him. 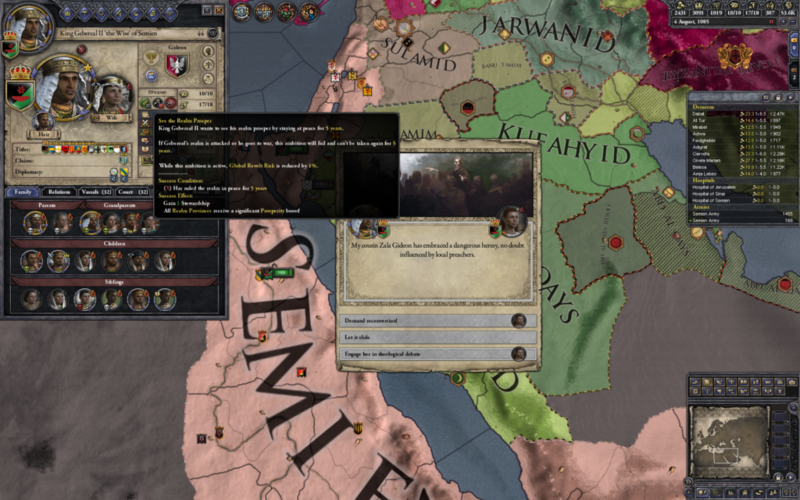 Truces in CK2 are always with a person rather than a country, so they disappear if either party dies. 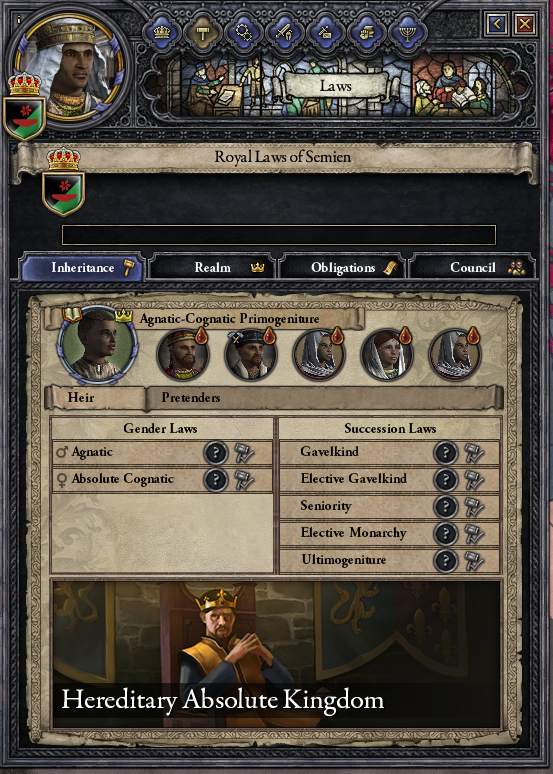 The crown prince continues to do yeoman work on the succession. 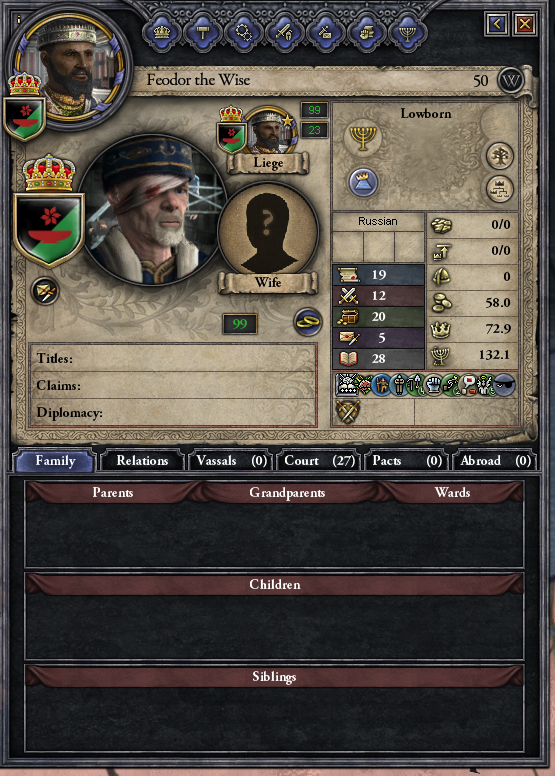 Afework the Blind, who drove the king mad, dies of old age, so I hire a new doctor. King Aman decides to go with an actual doctor this time instead of some weird mystic or prisoner. 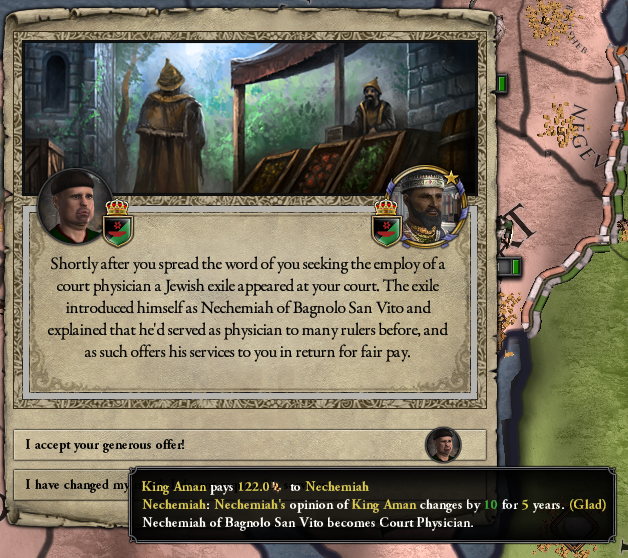 Afework was also my court rabbi, so I need a new one to spread Judaism to Jerusalem. 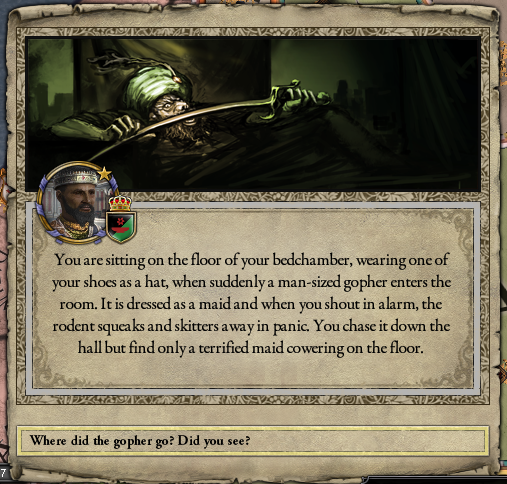 I enlist stupendous badass Feodor the Wise. Frankly I’d marry him to one of my daughters if he wasn’t celibate. Good lord, Gebereal, give the woman a rest! I’ve managed to work my way up to Tolerance 5 — one more step to Full Status of Women, another campaign goal. 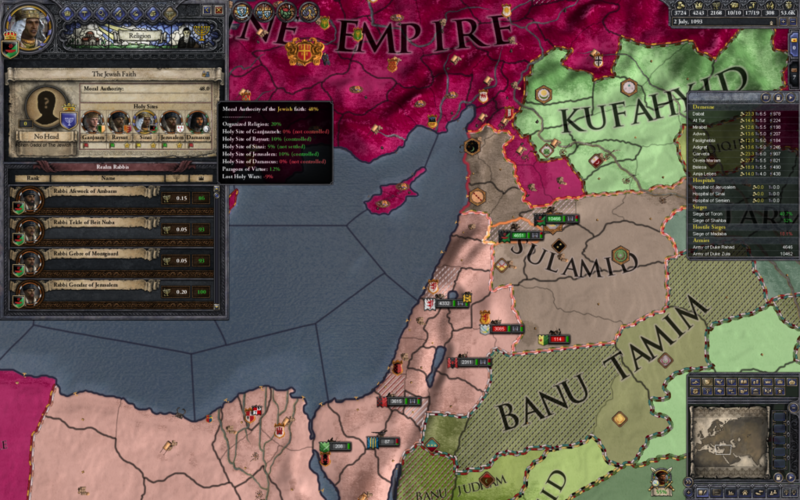 The Emir of Banu Tanim has taken over a second province in Oultrejourdain, so I declare holy war on him to get them both. 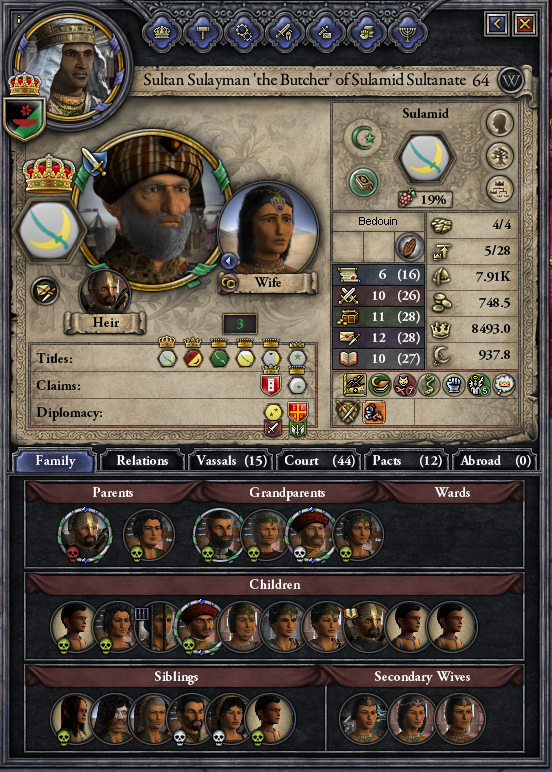 I prepare for another tough fight, since he has lots of friendly Sunni neighbors. Sheikh Murad the Strange joins the fray, but surprisingly few others. 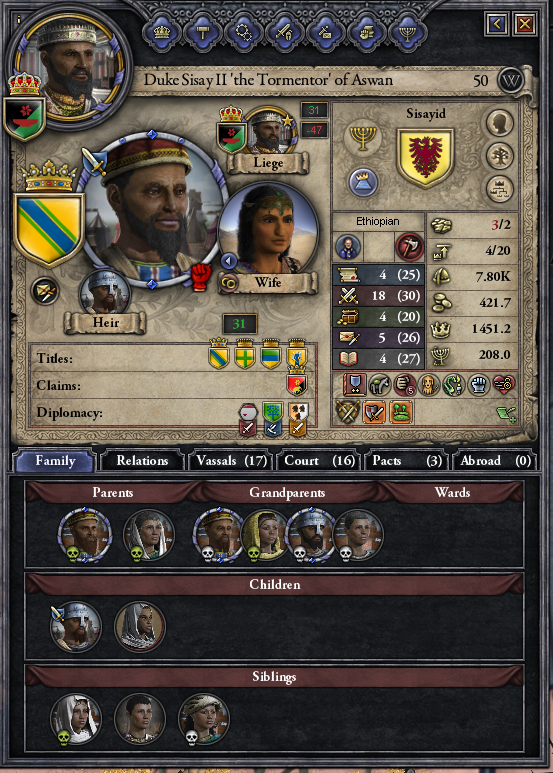 My own forces are led by Duke Sisay II the Tormentor, who is almost as good a fighter as the king himself. There’s that insanity cropping up. 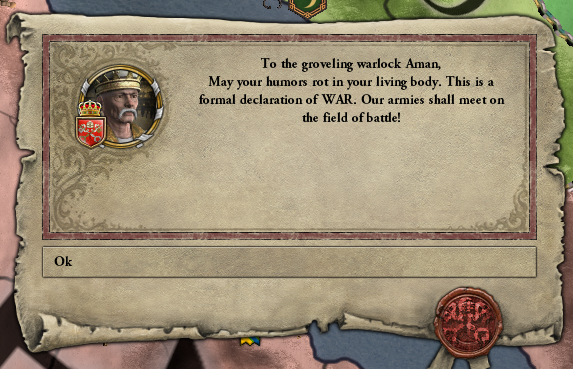 Aside from seeing his household servants as furry vermin from time to time, though, King Aman mostly holds it together. I think the crown prince and his wife have too much free time. The war is quick and surprisingly tame, with only a few countries joining in. 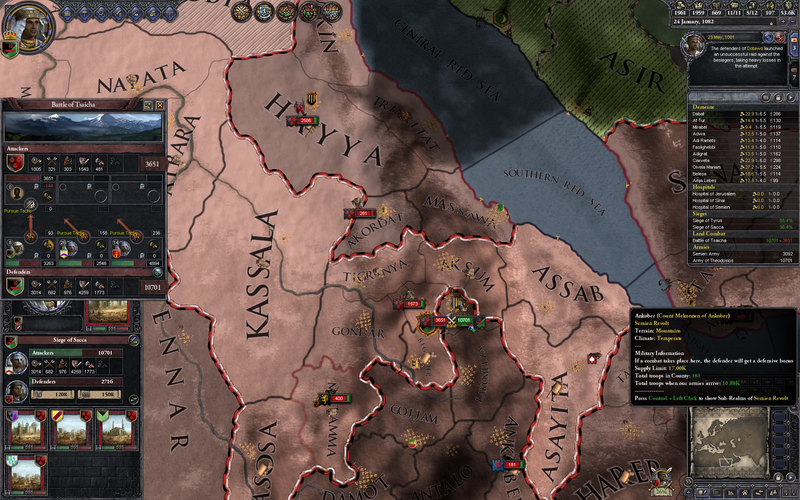 A few revolt armies crop up, but are easily dealt with, and my spymaster is doing a fine job keeping the vassals down. I have acquired a dog! Due to insanity, I get to name him Satan. 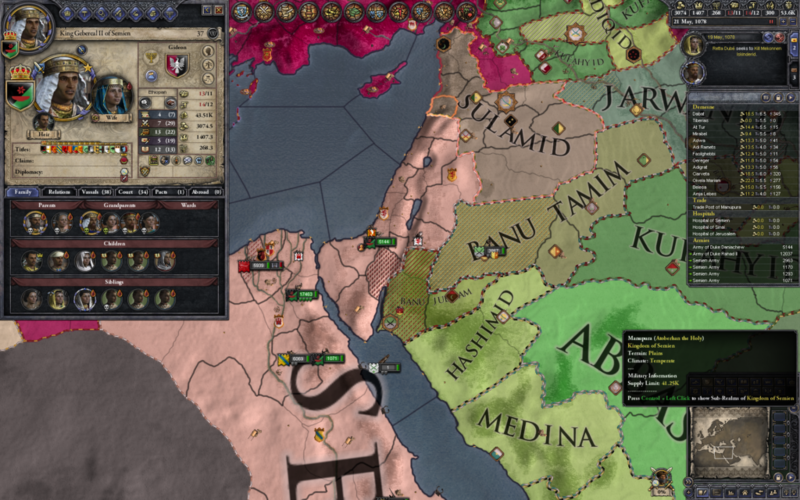 Dammit, how am I supposed to make peace in the Middle East if I can’t get a cat and dog to get along?! See, guys? How hard was that? Okay, I lied. 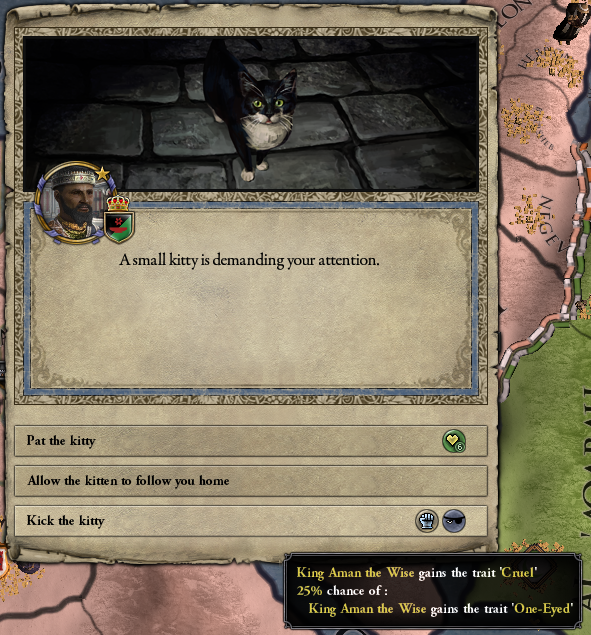 This is the best trait ever. 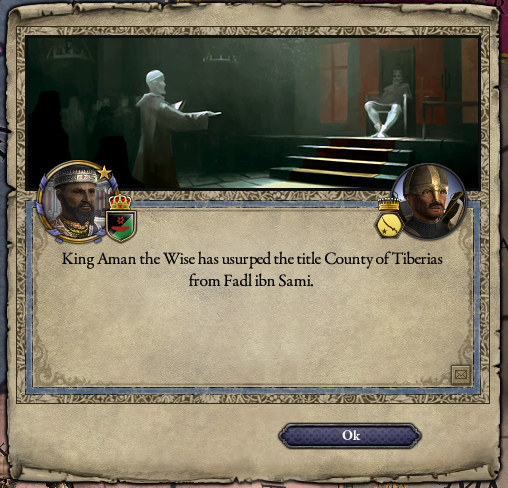 The ever-helpful Duke Berta of Ascalon declare a holy war for Tiberias while I’m still waiting for the truce to run out. Good luck, buddy! Then comes the bad news. You’d think the Christians would be more grateful for all the time I’ve spent womping the Muslims, but no, here they come. 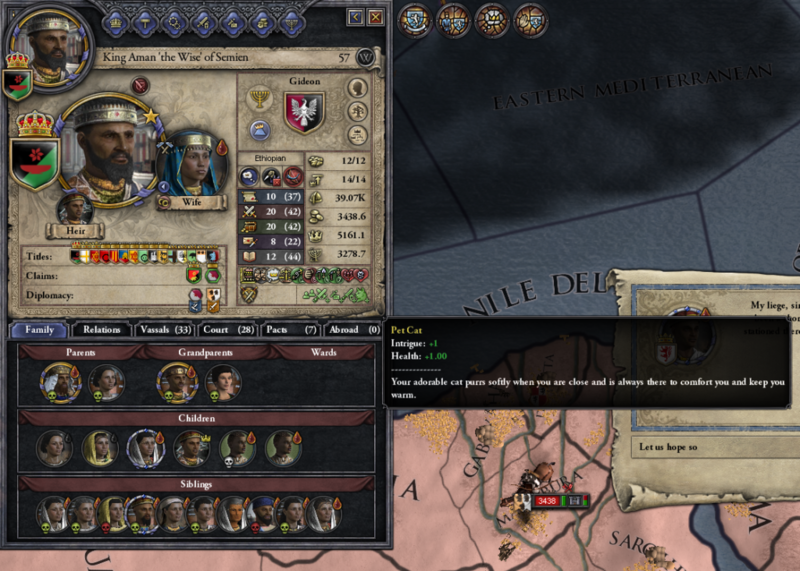 This guy is pretty foul-mouthed for an elderly pope. Armies begin to assemble from across Europe. 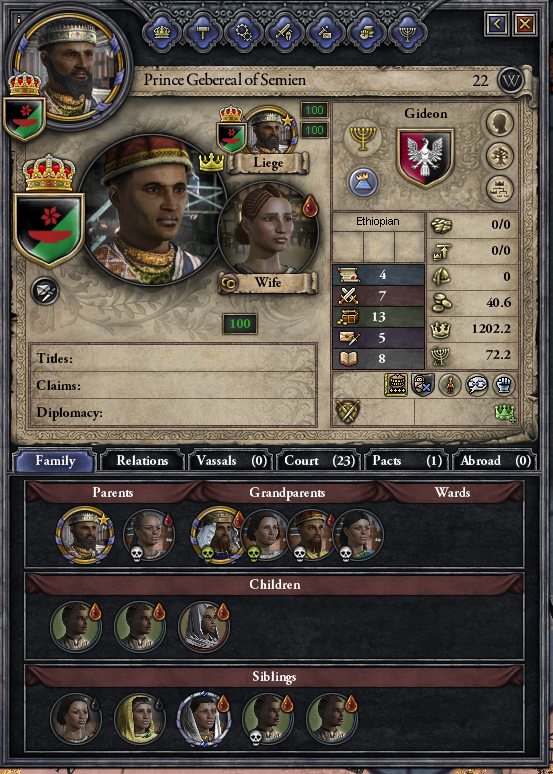 Duke Sisay II has grown even more awesome since last time! 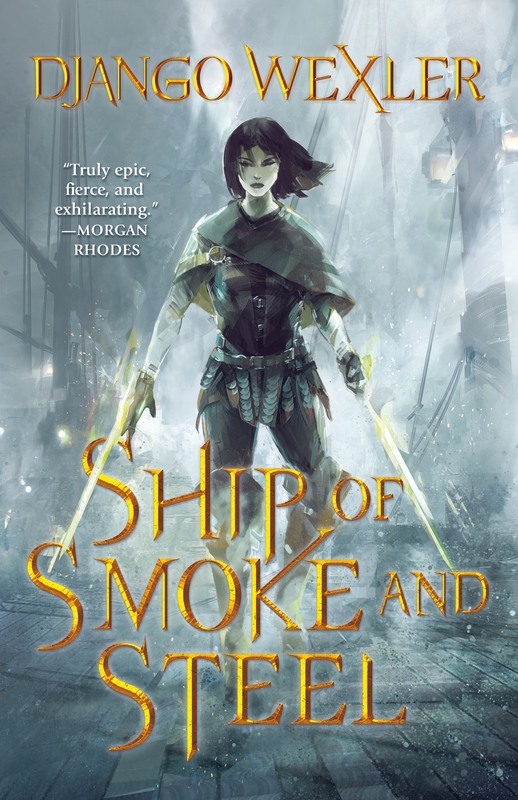 Unfortunately, in spite of Sisay’s prowess, I lose the initial confrontation, and things go quite badly for a while. The primary papal army besieges Ascalon, while I sneak around the edges, smashing the smaller contingents and re-taking fallen castles. Quite a few nations have responded to His Holiness’ call, unfortunately. 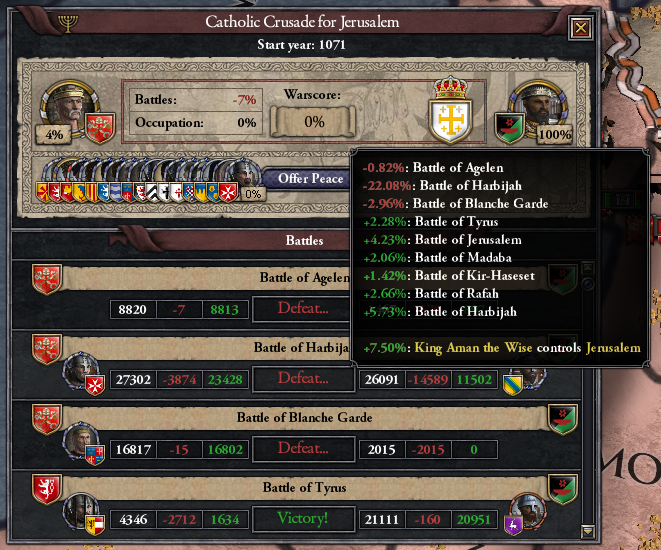 I’m not sure how I manage to get slaughtered so badly at Harbijah. Meanwhile, Egypt has been infected by some kind of contagious madness! Are we sure Afework is dead? 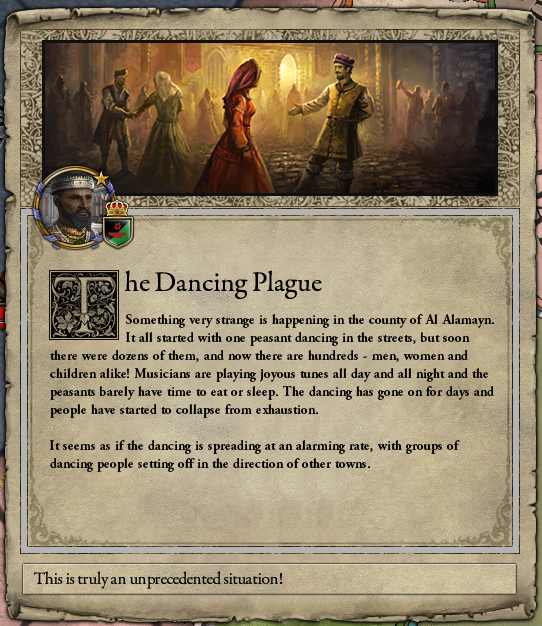 The Dancing Plague spreads quickly as the war rages on. Pope Innocentius the Wicked refuses to make peace, even though he’s now losing badly. I have patience, though, and am not going to repeat my mistake of sailing to Spain to finish a war faster. 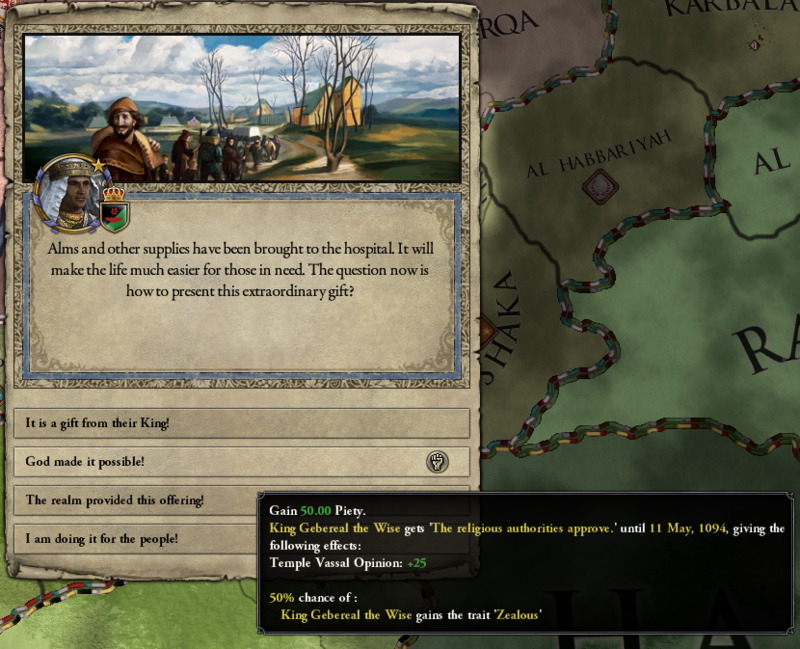 Finally, after a few more wallopings, he agrees to a white peace and the crusade ends in failure. Peace at last! 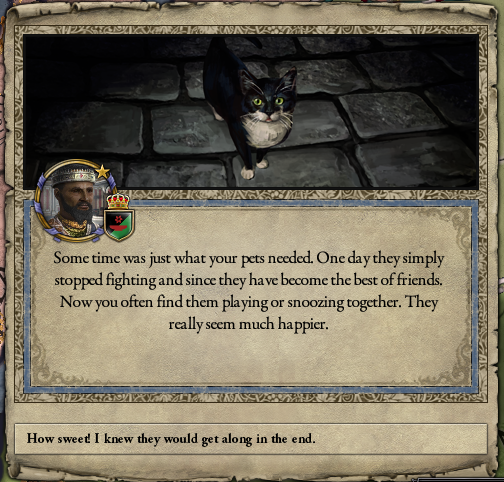 My vassals are contented. 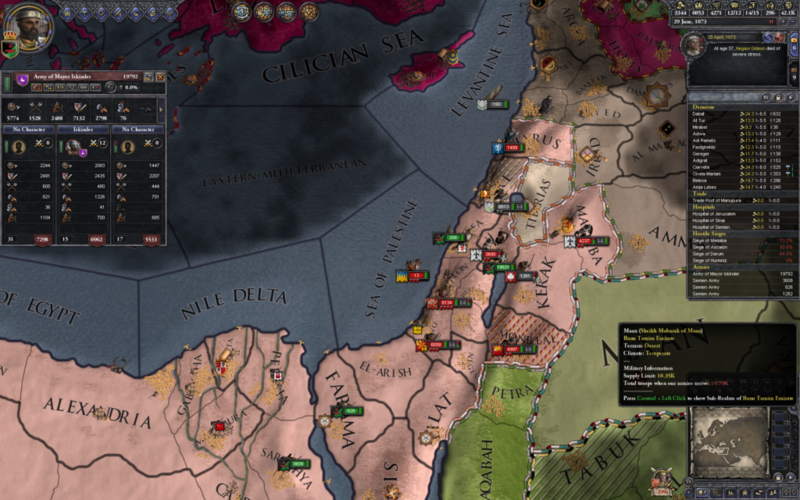 Duke Berta even managed to take over Monreal, leaving only Tiberias and two northern counties to complete Israel. 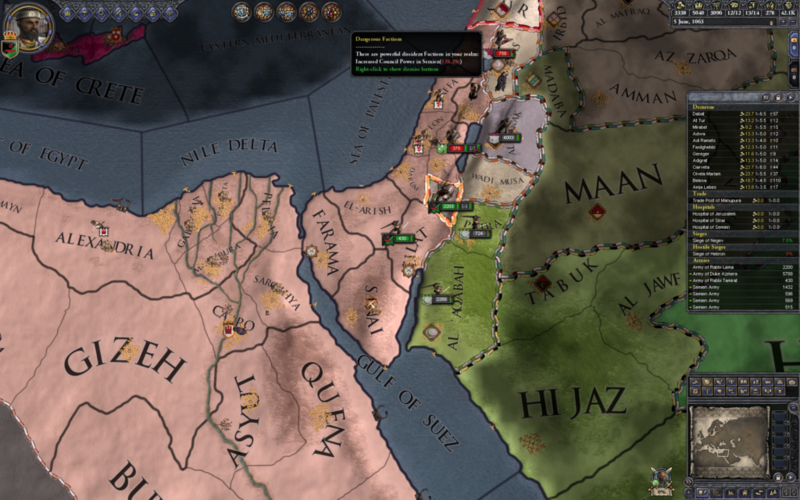 With the truce expired, I launch the war for Tiberias. That goes smoothly! Only two more to go. I launch a war for the next one! Sadly, Tiberias is Aman’s last triumph. 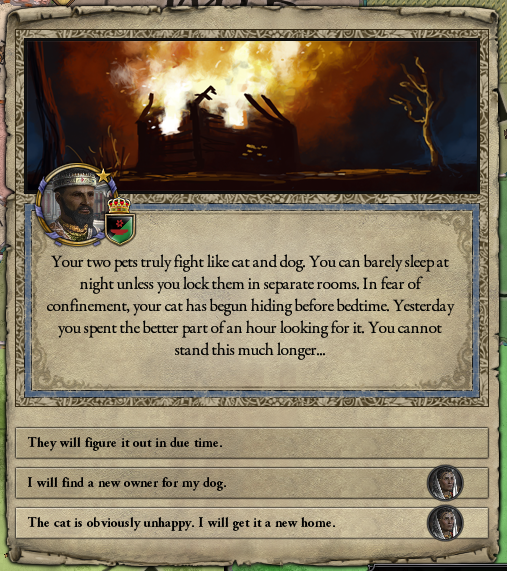 He dies after a long, successful reign, outlived by both his loving pets. Long live King Gebereal II! King Gebereal is about where we left him, stat-wise. He’s devoted himself to learning and science. 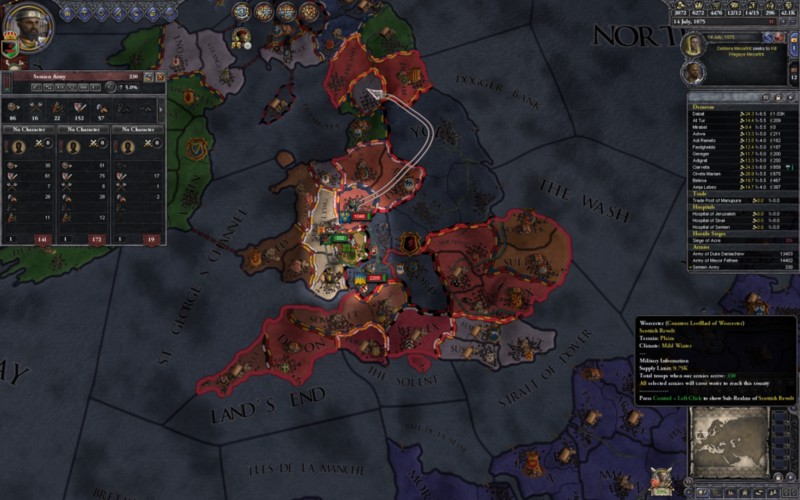 His father’s war goes on, but the vassals are much more restive under the new king. 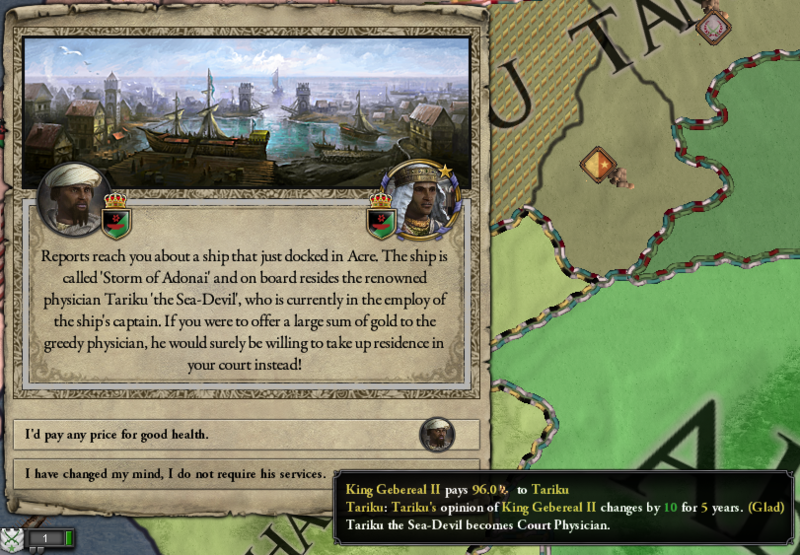 Still a better idea than hiring random imprisoned magicians, though “Tariku the Sea-Devil” isn’t the most promising name for a doctor. King Gebereal’s oldest son dies at 21. Fortunately, he has three brothers, one of whom already has a son of his own. 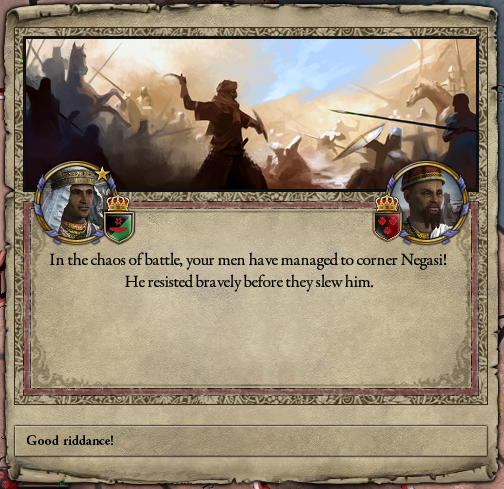 The new Duke of Aswan, Negasi II (successor to the mighty Sisay II) is a die-hard rival of the new king and hates him with a burning passion. 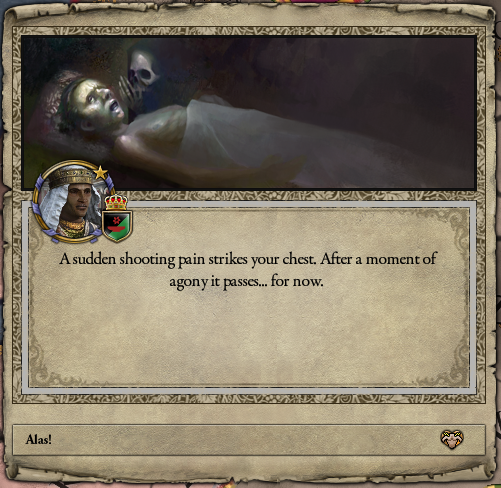 That’s not ideal, so I send for my assassins. 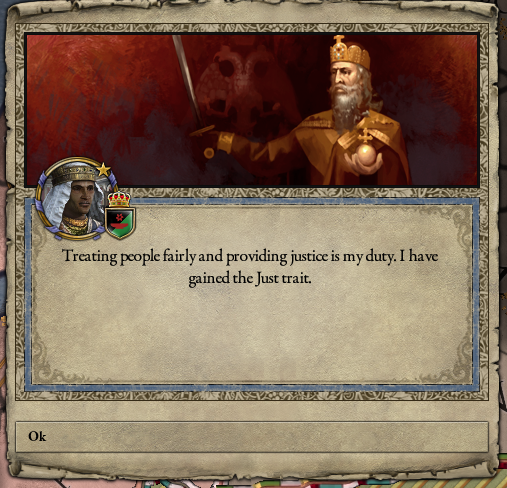 This apparently results in JUSTICE. 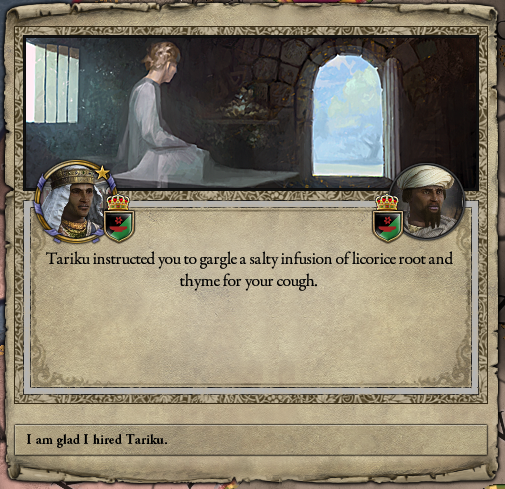 Tariku passes his first test with flying colors! His second test, maybe slightly less so, but it’s better than deformed elephant brains or whatnot. 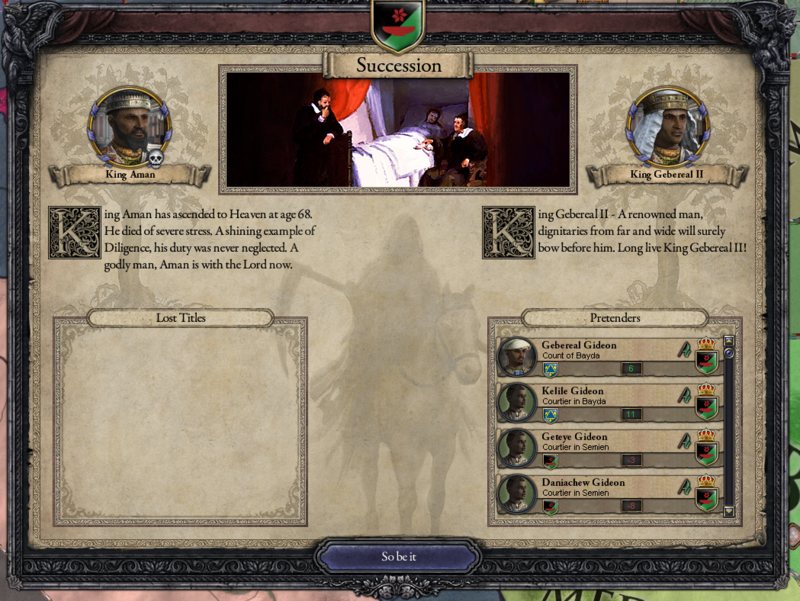 In spite of the efforts of my assassins, Duke Negasi manages to survive to raise a revolt against me, and gets quite a lot of friends to help him out. 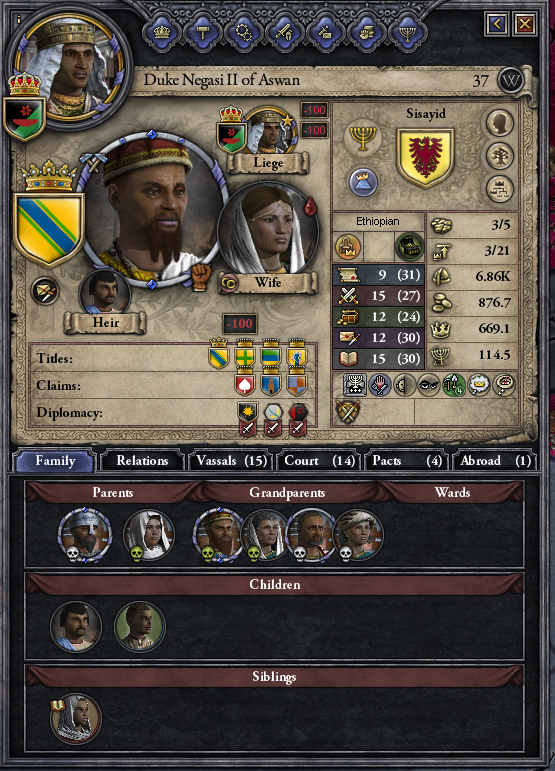 This is a serious civil war, with the majority of the dukes lining up against the young king. 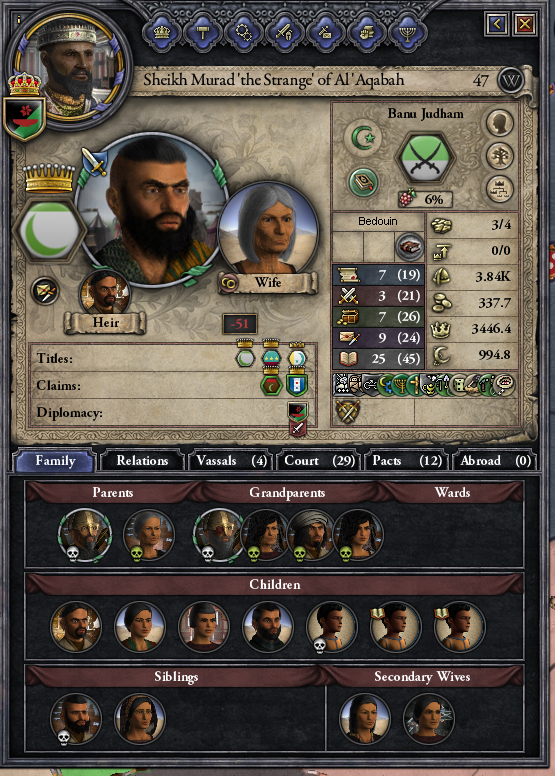 I quickly hire every available mercenary company, but it’s still tough odds. 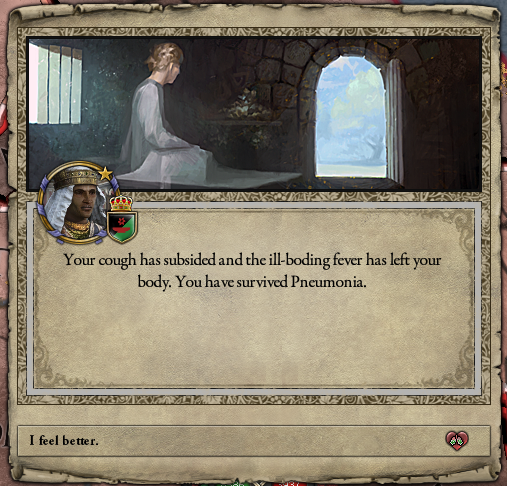 On the plus side, I did not die of pneumonia, which is something! 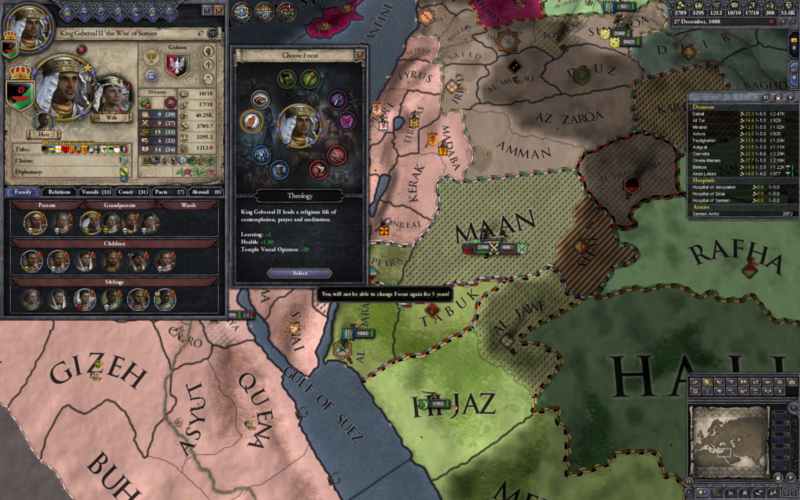 One advantage to hiring mercenary companies is that you get to use their characters as generals. Sometimes they are pretty awesome, like this fellow. My combined army confronts one of several rebel forces and is victorious, but there’s a lot of work left to do. 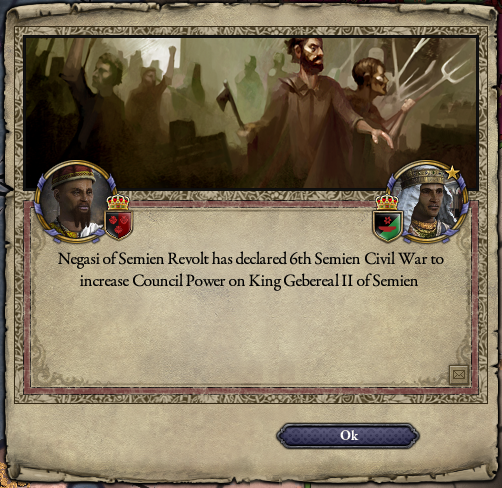 As you can see, quite a bit of Semien has turned against me. 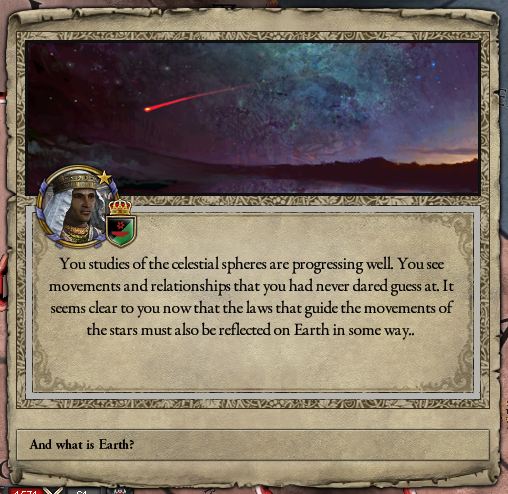 Even as rebel armies descend from the north, King Gebereal steadfastly continues his study of the stars. 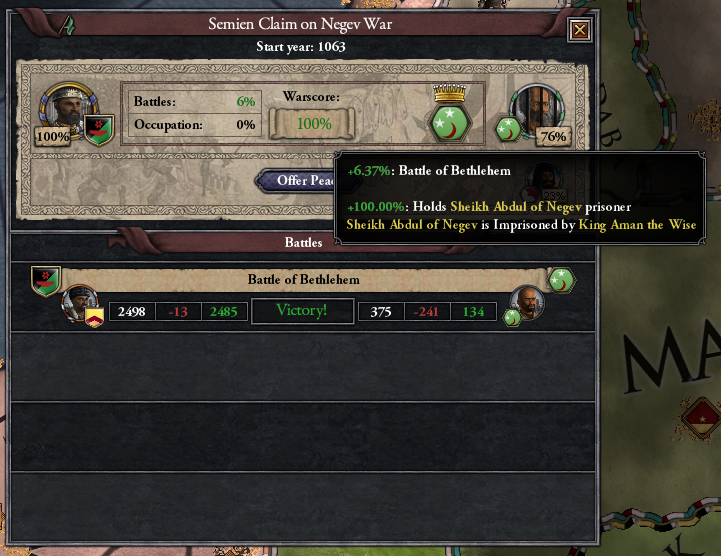 Duke Negasi manages to get himself killed in battle, which at least saves some money on assassins. Unfortunately the war goes on. My army takes heavy casualties but scatters rebel forces one after another. Gradually the king regains the upper hand and proceeds to hunting down the remaining enemy. Chalk up another Duke, a different Sisay! King Gebereal has triumphantly concluded that the earth moves around the sun. 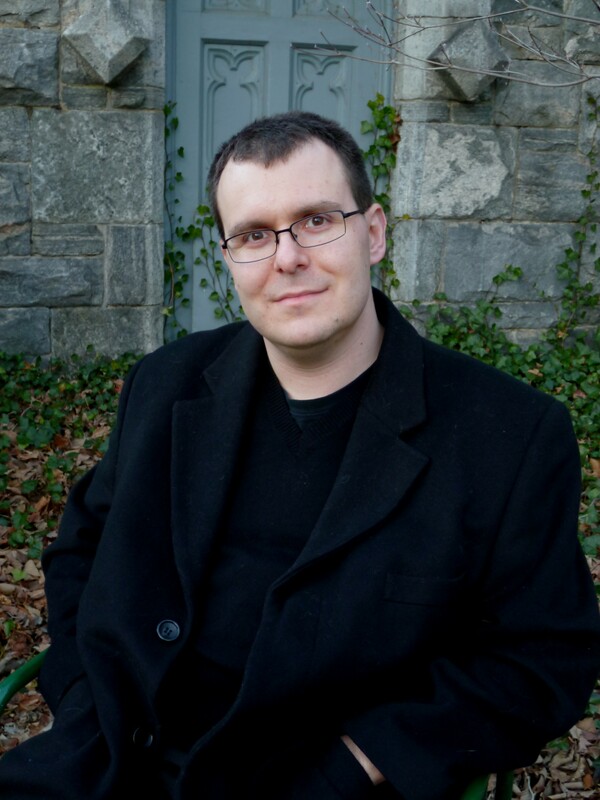 He chooses to publish his findings, and the hell with what the religious authorities think! The revolt finally ends. No white peace this time — half the great lords of Semien go to prison and have titles revoked. 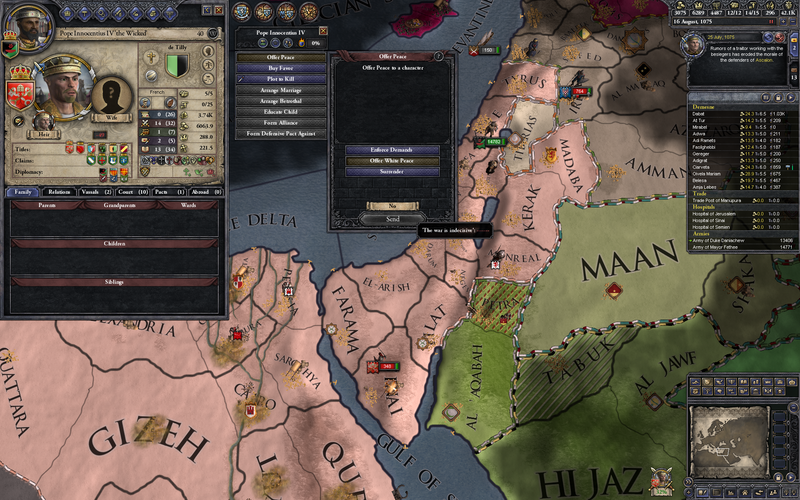 I do some judicious redistribution, creating new dukes and giving them authority over the rebel lands. 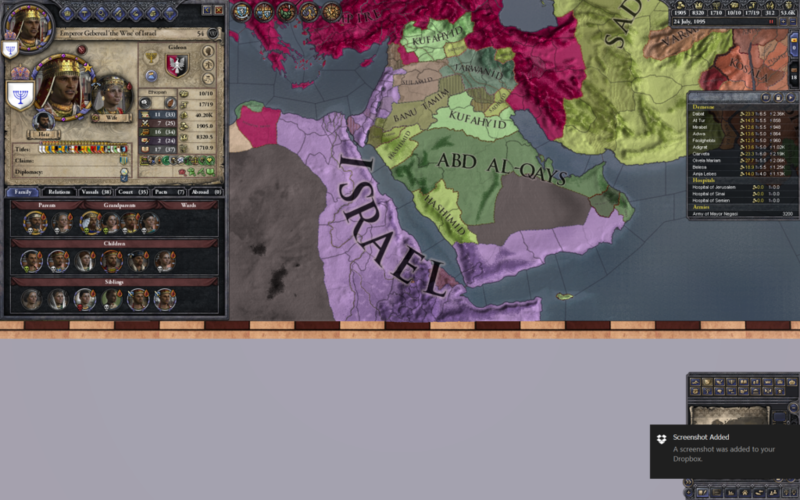 King Gebereal turns his attention back to Israel now that his revolting vassals are safely in jail. 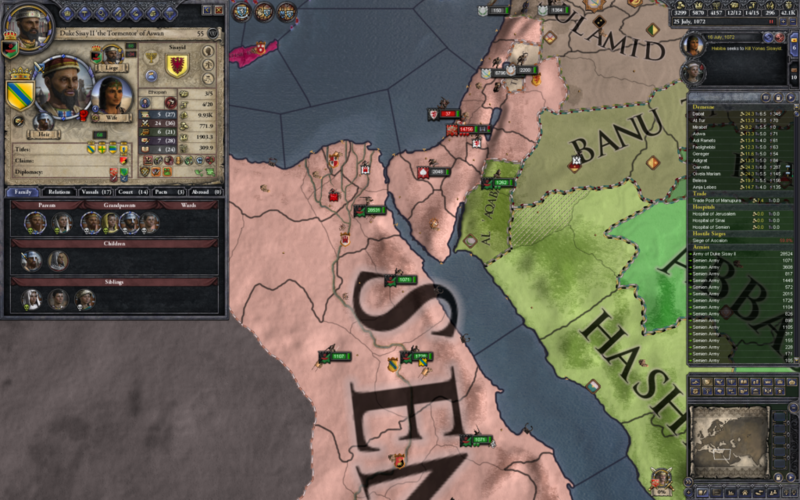 There’s one last county to take before the new kingdom can be created. 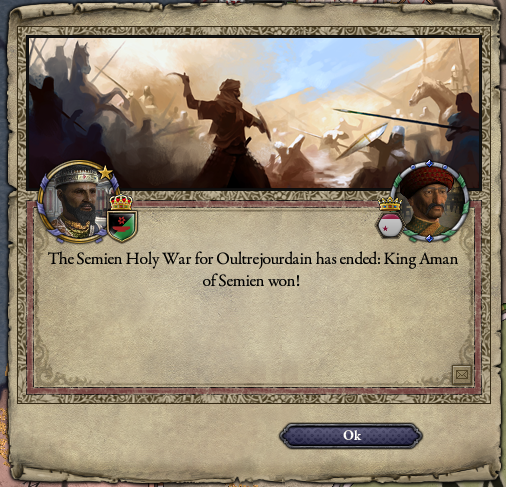 Unfortunately, since the last war finished on his watch, Gebereal has a truce with Sultan Sulayman the Butcher with nearly five years left to run. 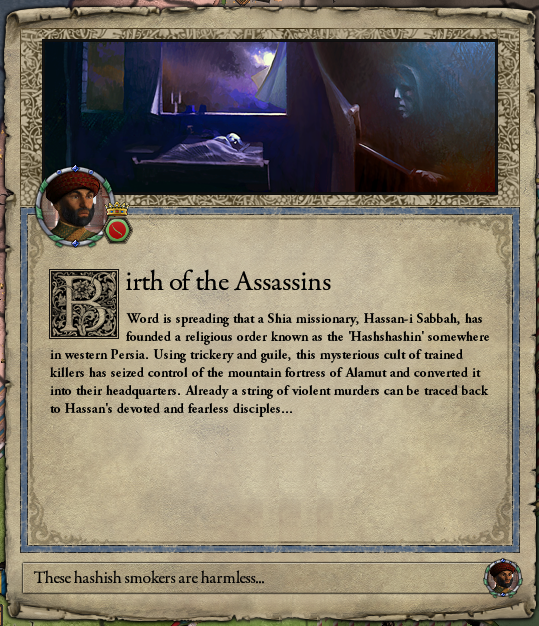 I try to assassinate the sultan, but his court likes him so it’s not likely. But she turned out to be the last wife of old King Aman. 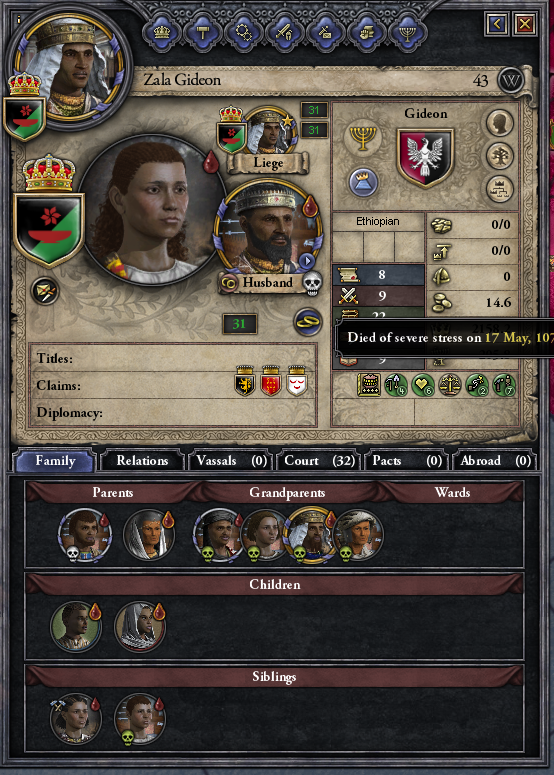 TFW you accidentally marry off your son to his grandma-in-law, right? #FirstWorldProblems. I have a good laugh and find Zala a more suitable husband so she can produce additional offspring. 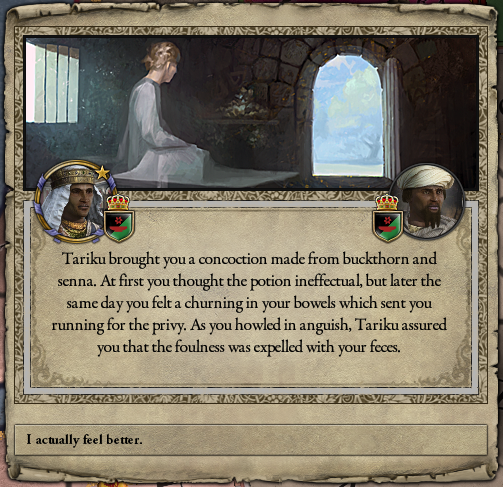 While the truce runs down, I decide to stay at peace for a while and try to increase the realm’s prosperity, saving up money for great events to come. 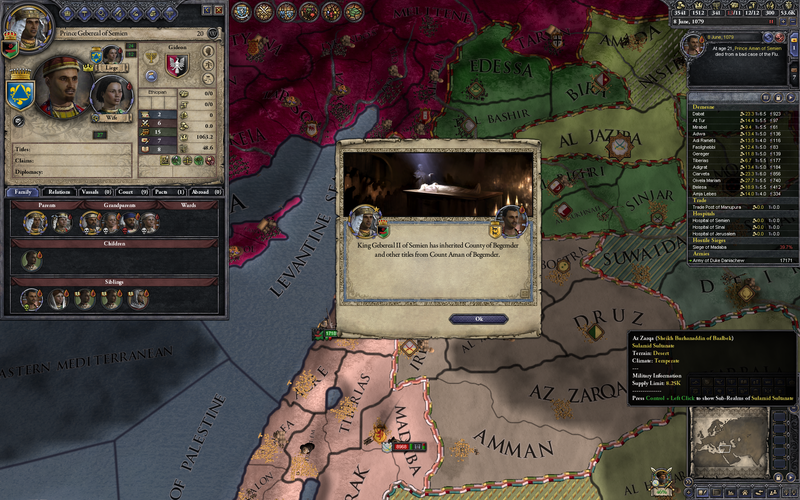 Meanwhile, Zala embraces heresy, but I’m able to defeat her in theological debate and she recants. 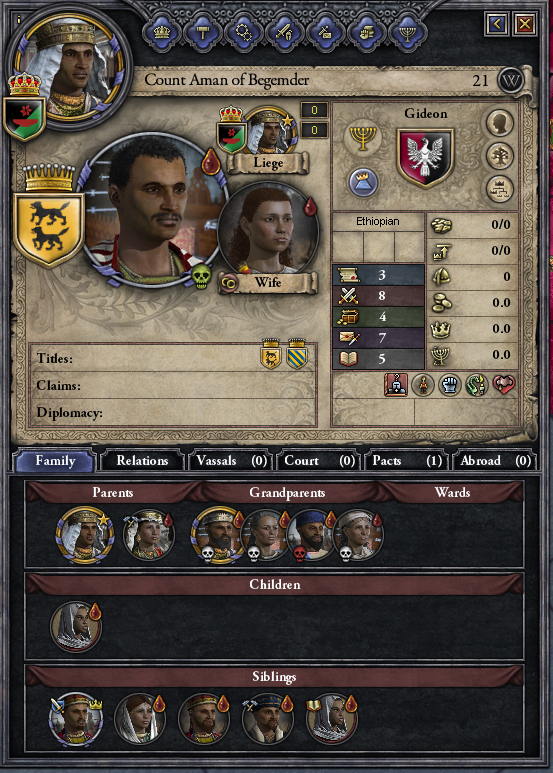 The succession is looking nice and clean, with all the women married to safe husbands. 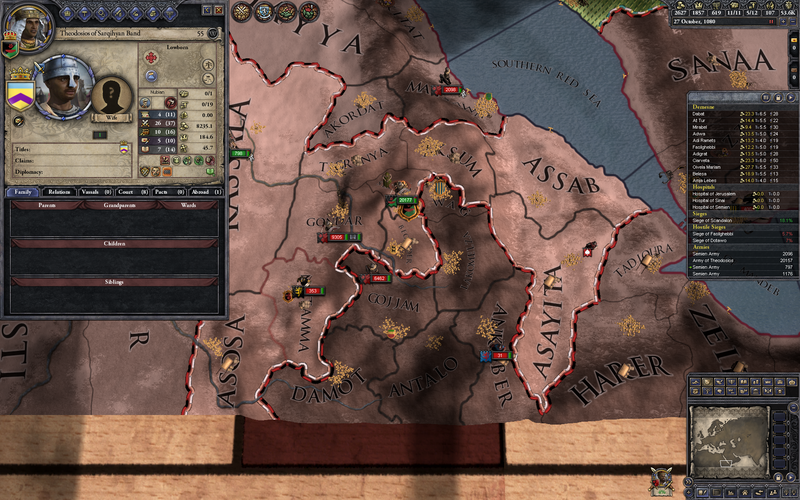 Fortunately, peasant revolts don’t count against “See the Realm Prosper”, and I don’t run into any major wars. 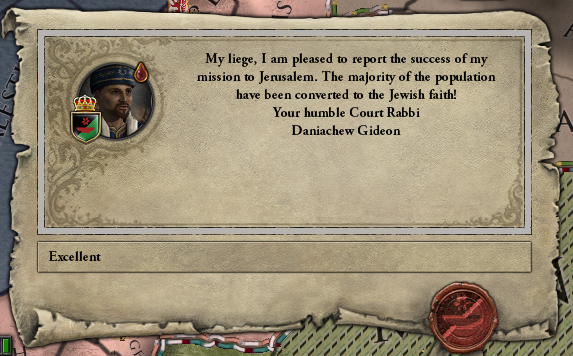 Finally, my new court rabbi (one of my sons) gets through to the stubborn people of Jerusalem! This is a prerequisite for both my goals — creating the Kingdom of Israel, and rebuilding the Third Temple. I can’t do the former until the truce runs out, but I can work on the latter. 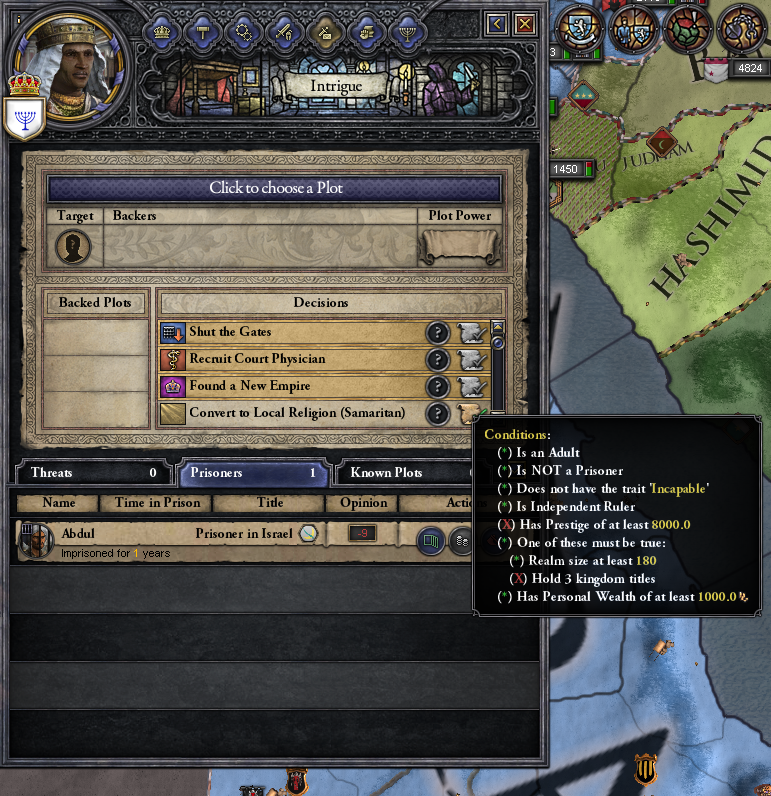 Since I control Jerusalem and it’s now Jewish, the only remaining obstacle is to build 1500 piety. I’m at about 1000, so not far to go! 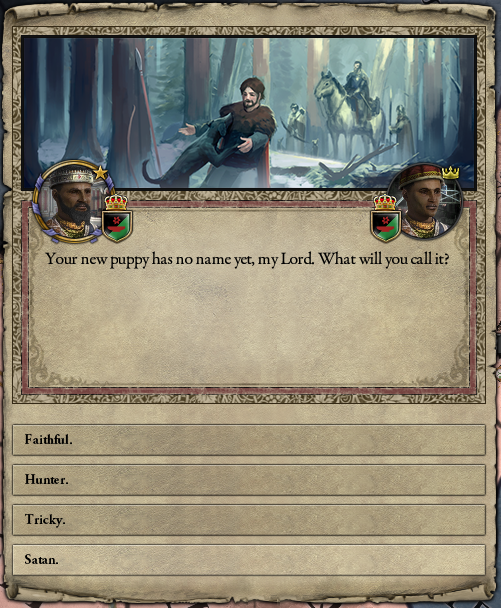 King Gebereal’s dog, Faithful, is not nearly as good as King Aman’s dog Satan, and likes to attack people at random. At 1200 piety. The king dedicates himself to the theological arts to prove his worthiness! …pretty sure this is unrelated. 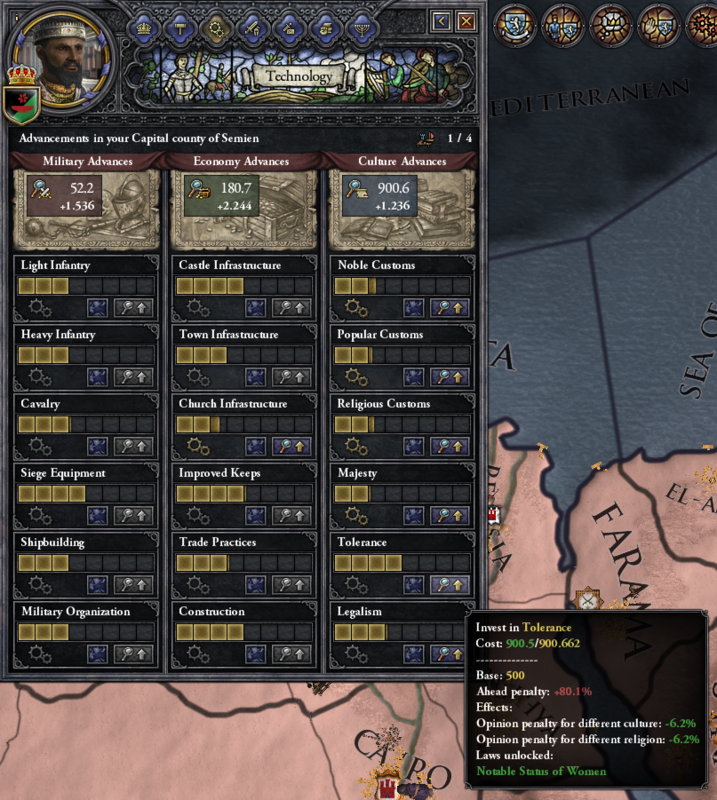 I start taking every possible decision to become more pious. Passover is celebrated, finally. 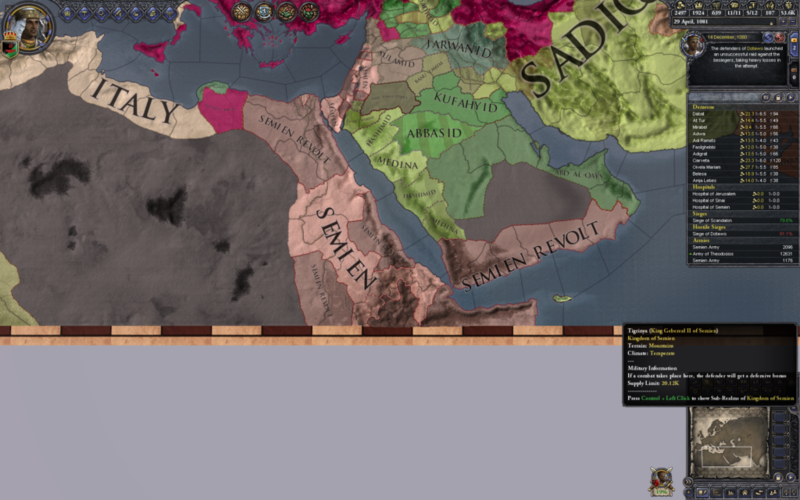 After five years, the realm is thriving and the old sultan is dead. 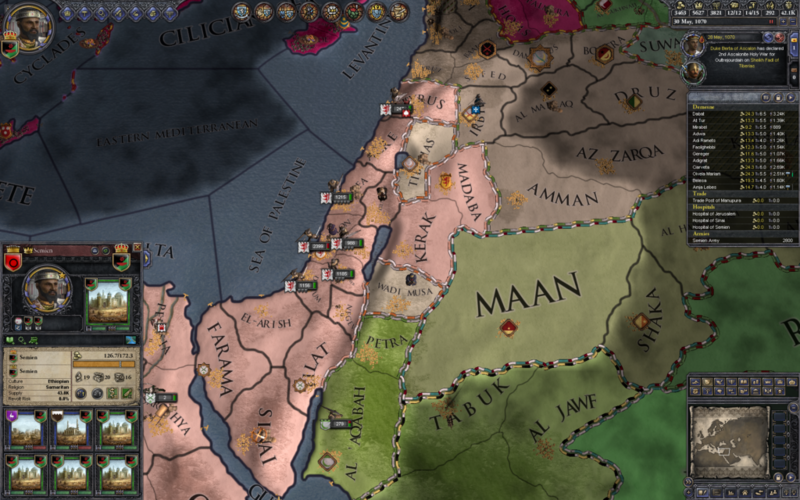 I’m at 1450 piety, so I wait a little longer before starting the final war for Israel. 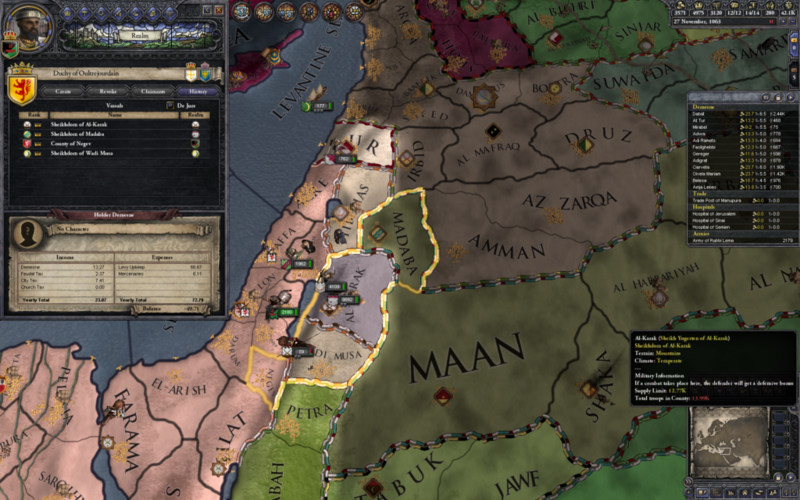 After getting to 1500 piety, first I carefully save the game. In my previous playthrough, this is where I ran into difficulty. 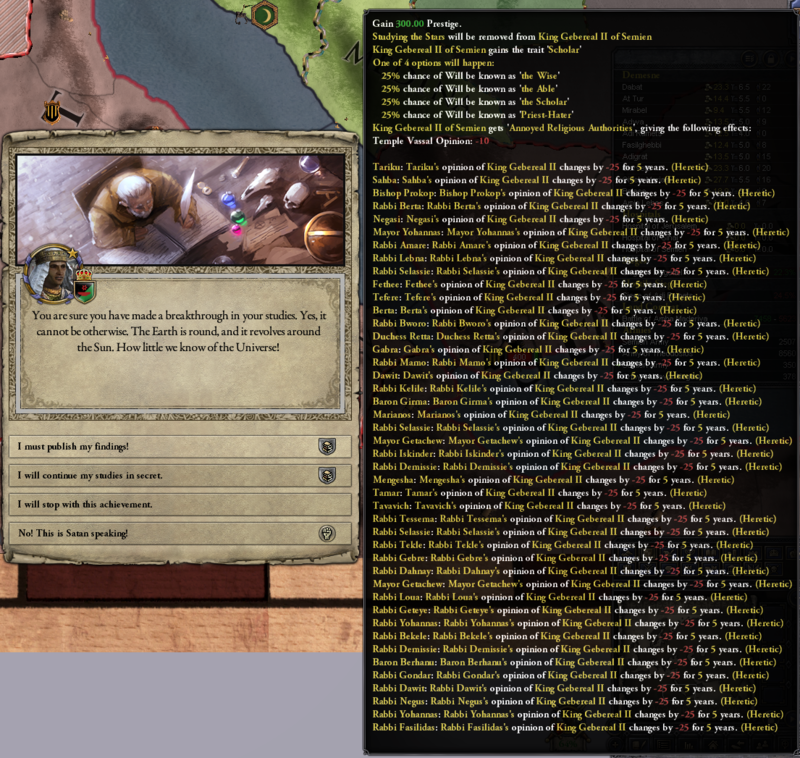 After beginning construction, my king died, which canceled the completion event but wouldn’t let me start over either. This time, I’m not in Ironman mode, so I can fix that if it happens again. 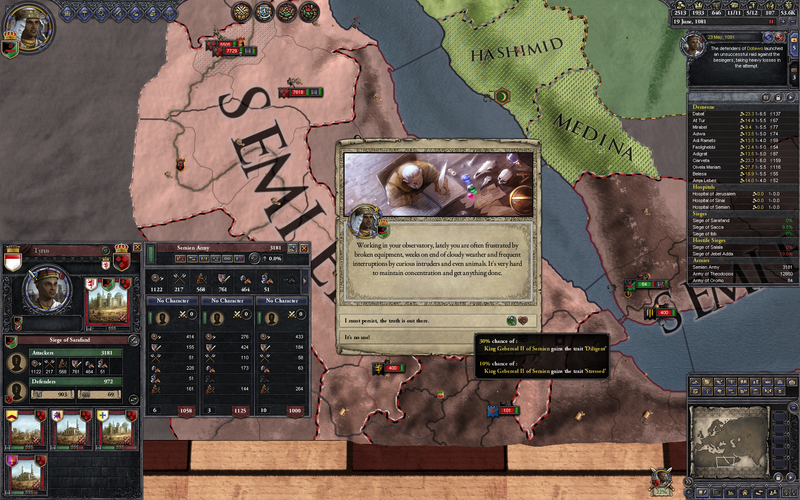 That done, I launch the war (a simple de jure claim war) against the Sulamids. 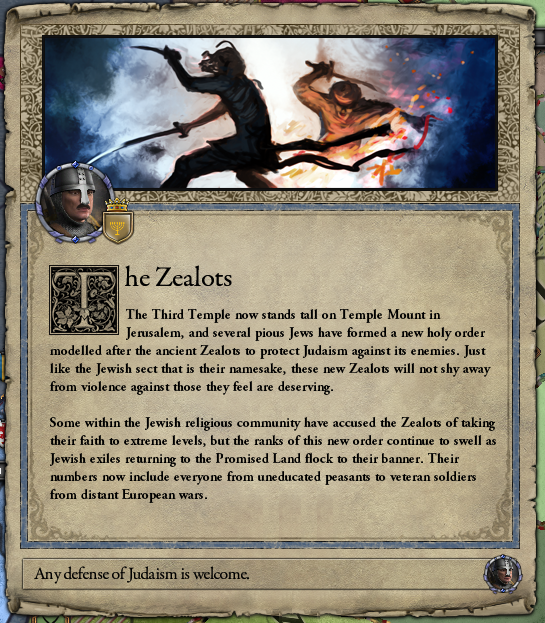 Judaism is suffering from low moral authority at the moment due to other Jewish rulers (that is, my vassals) losing their attempts at holy wars. 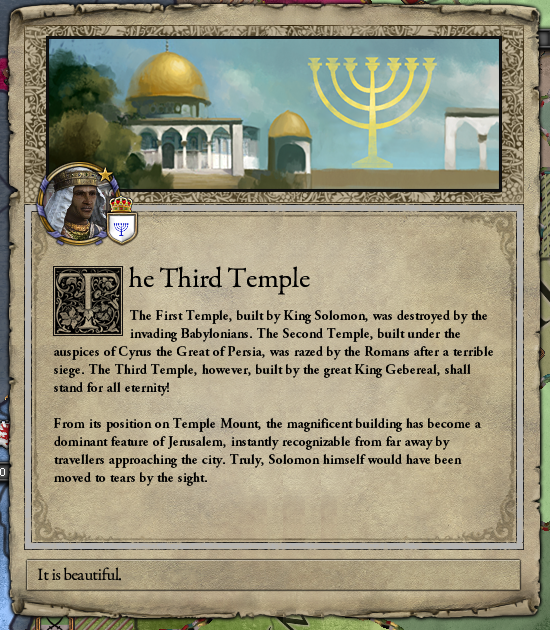 The Sulamids are quickly defeated, and the last piece of Israel falls into my hands! 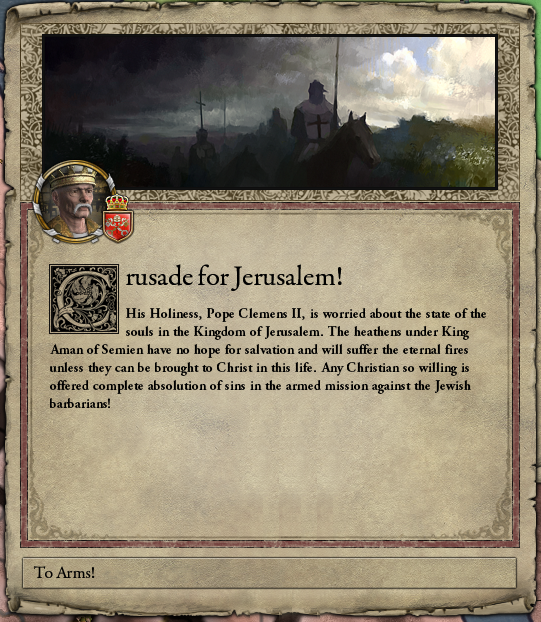 With the conversion of Jerusalem, all the conditions are now in place. Time to press the button! 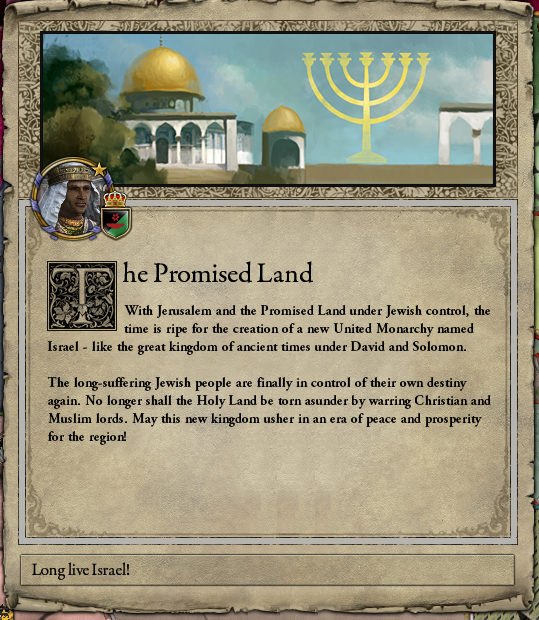 I quickly switch my primary title to Israel. There’s another step I want to add, though. 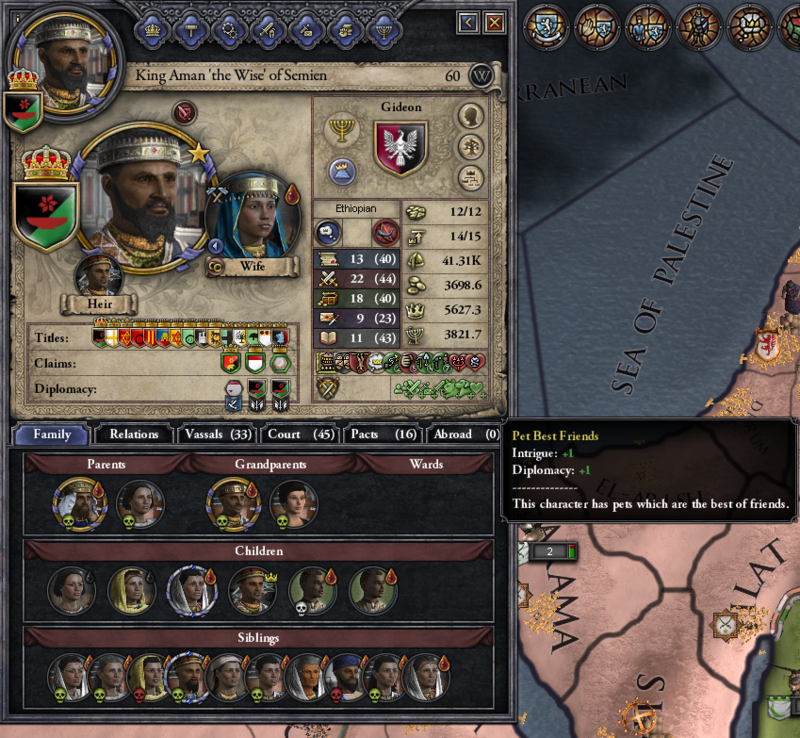 Currently I happen to be king of two separate kingdoms — Semien and Israel. The combined realm is getting pretty large and the number of dukes it requires is high. 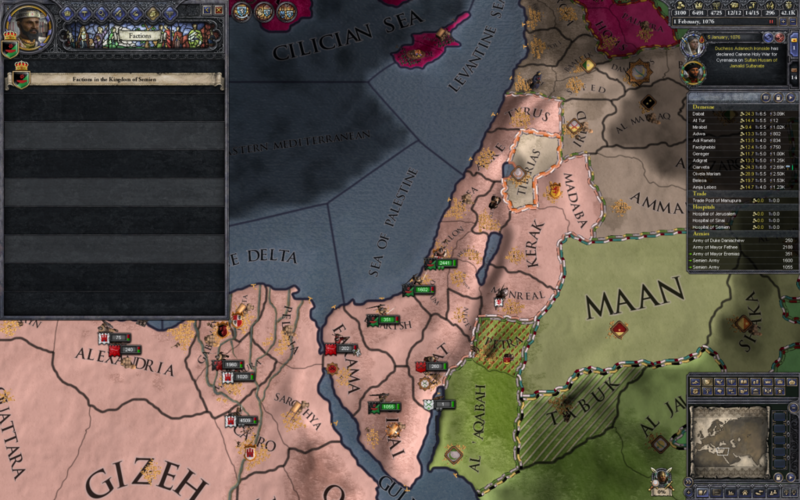 What I’d really like is to become Emperor of Israel, which would allow me to have kings as subjects and do some consolidation. That takes 8000 prestige, and I have 5500, so it seems achievable. 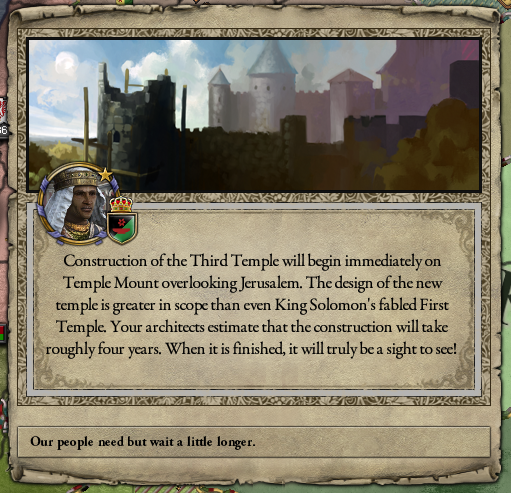 Before that, though, we want the Third Temple finished. It doesn’t take much longer! Another goal down. 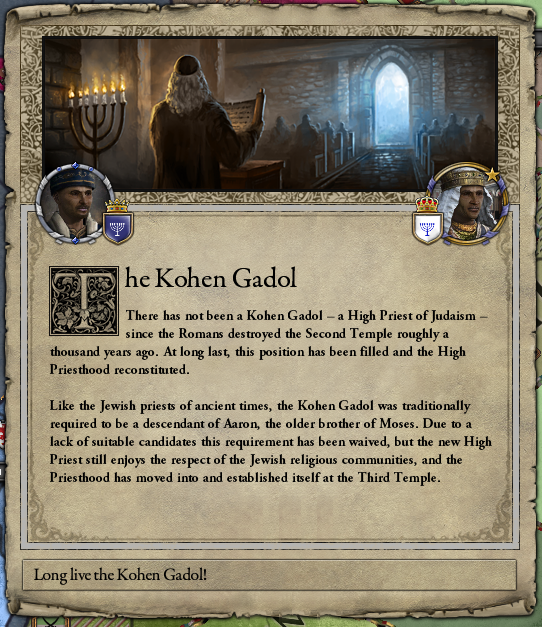 With the Temple rebuilt, Jews can have a high priest again! 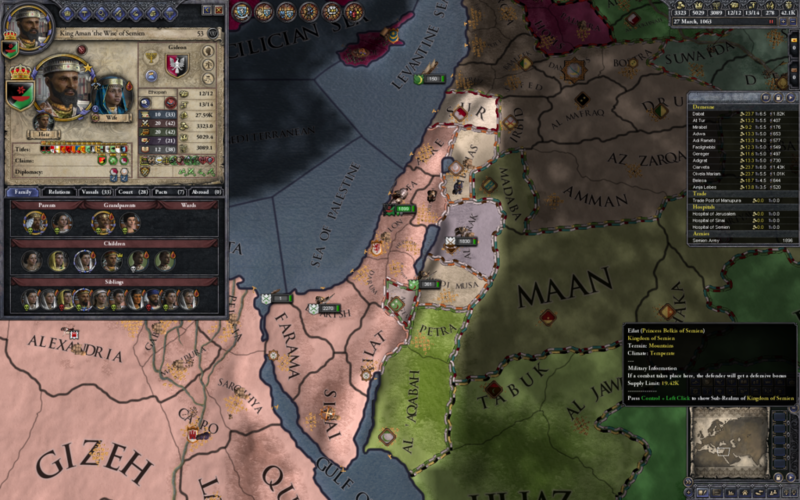 In CK2 he functions a bit like a Jewish Pope, able to declare Great Holy Wars and similar. 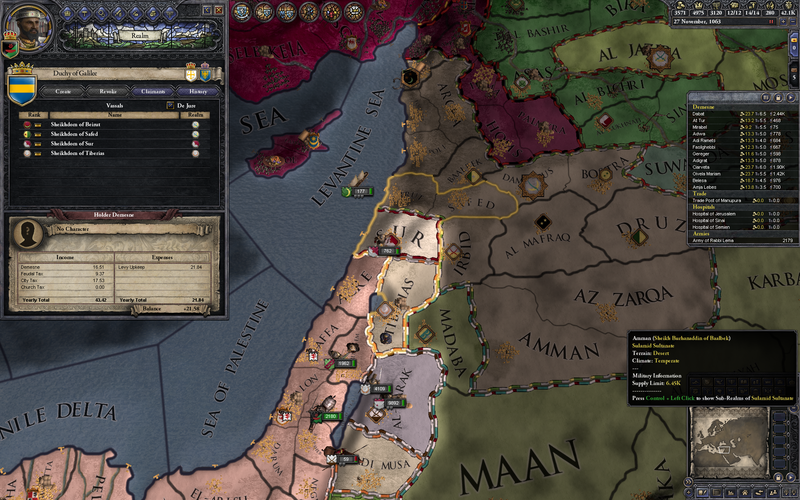 Importantly, the high priest is my vassal, since I’m king of Jerusalem. So he should be inclined to do what I want. 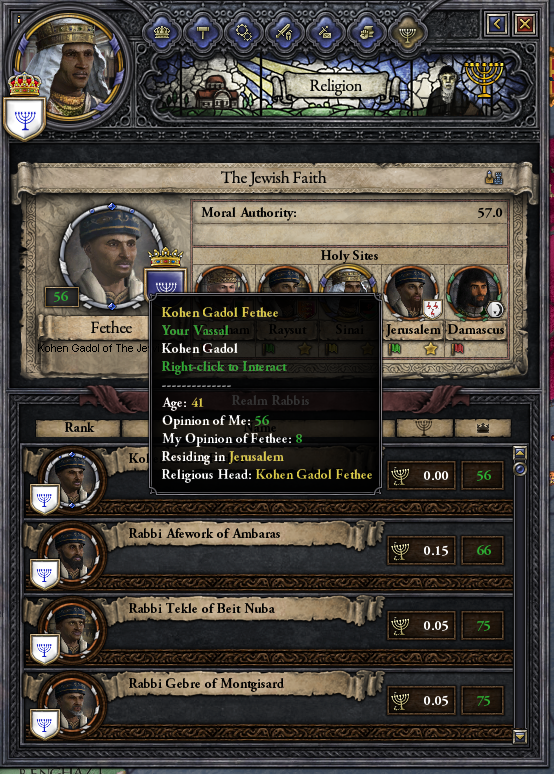 Jews even get their own slightly creepy religious order to match the Assassins and the Templars! With that all done, I start creating titles. 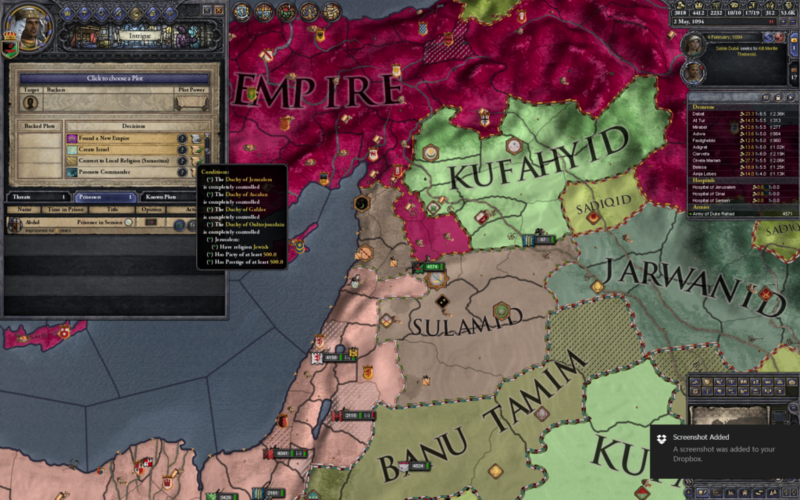 There are a bunch of kingdoms and dukedoms that I can create, because I own all the land that composes them, but I haven’t done so because it’s expensive and I’d have to find someone to give them to. Creating them gives me prestige, though, and by spending a bunch of gold I’m able to conjure my way to the magic number of 8000! 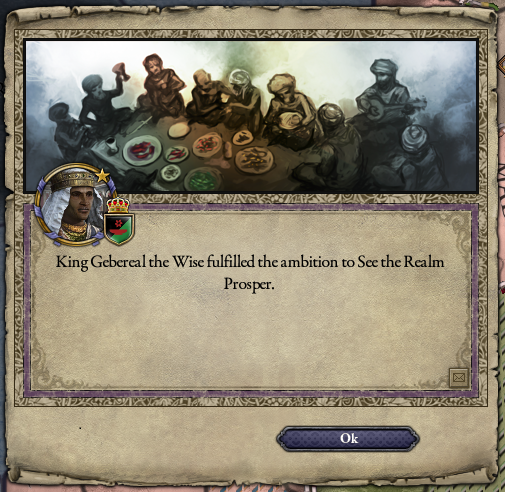 And with that, I am Emperor Gebereal the Wise, of Israel! It’s such a nice purple color too. Not that I plan on stopping there. 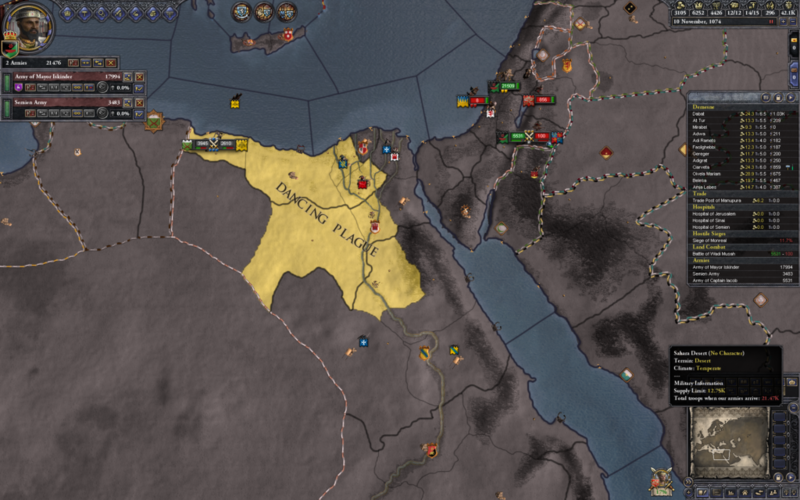 Being emperor lets me control a larger realm, and having the high priest in my pocket should allow me to declare “crusades” to seize big chunks of territory. There are still two Jewish holy sites to reclaim — then, who knows? Current Year: 1095 AD. Current Status: Imperial.